This is our art deco hummingbird engagement ring. It is a stunning example of our nature inspired engagement rings. Beneath the center stone is a lush garden of flowers and vines. And feed We have created a matching band you can see if you click on the image. It holds a 5-6mm square or round center stone. The accents are 2mm rounds. Engagement rings are one of the most recognizable pieces of jewelry. And whether you’re already engaged, about to be, or are hopelessly single, looking at diamonds and gemstones can always be enticing. Over time, as it is with any accessory, engagement rings have experienced their fair share of trends. We are on the forefront of these trends as we get to make the jewelry that people want, but can’t find at the mall. This is one of our 2 stone Custom Engagement Rings. We also have it in a version without the stones on the band. 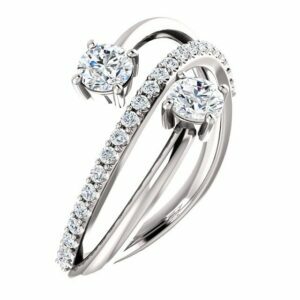 The accent stones are set in a french pave setting, but could be changed to a standard shared prongs setting. This stunner has the 2 main stones in a bypass setting, split by a band of diamonds. We think this would look great as a cocktail ring as well, but using colored stones at the big ones. This Art Deco Cathedral Engagement Ring is the perfect example of a custom engagement ring. You won’t find anything like it anywhere else and is a one of a kind. This one has milgrain and diamonds on each side of the band, giving it crazy sparkle and detail in its design. What makes this Art Deco Solitaire Ring so beautiful it that it has a lot going on even with only one stone in it. All of the real estate that could be given to stones is filled with leaf patterns. There is also plenty of milgrain that adds another design element to this Art Deco Engagement Ring. This is one of skull engagement rings. It has a V halo surrounding the center stone with skulls on the shoulder. They are accents with stones as well. Oddly enough, skull bridal jewelry sells more than one would think. We also have a matching band that we can create with it. This art deco skull ring has skulls on both sides of the ring with wisps of smoke blowing around them. The center stone is surrounded by a halo of stones that continue down the shank of the ring. This is one of our nature inspired Tree Branch Engagement Rings. It has antiqued recesses that truly give it a realistic look of tree bark that will only grow over time as the Patina of the Silver sets in. 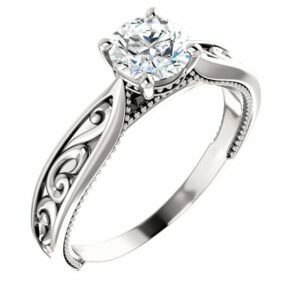 It is shown with a round center stone, but any shape can be used as long as you are ok with a prong setting. CLICK THE IMAGE TO SEE A FINISHED RING…IT LOOKS FAR BETTER! This Sculptural Solitaire Engagement Ring is one of our favorite bypass rings we have made. The shank is a wave of motion is it travels from one end of the ring to the opposite end. The 6 prong basket securely holds even the largest stone intact. This Milgrained Solitaire Engagement Ring is a unique take on the traditional solitaire engagement ring. The cathedral shank comes to a point in the center of the stone. It is then cut out and filled with elegant scrollwork while milgrain creeps up the sides and around the 6.5mm center stone. Custom Engagement Rings are a chance for the buyer to oversee almost every part of the custom jewelry creation. This allows you to create a finished piece as unique as the wearer. Because you will wear your engagement ring every day, why not take the time to create a one-of-a-kind custom engagement ring that will act as a daily reminder of your love and make you stand out in a crowd of people wearing big box chain rings? Rather then purchasing a mass-produced ring from China, have a symbol of your dedication and commitment created by designing a unique Custom Engagement Ring – the result of this will become a treasured story about the most significant object she will ever own. This is one of our many nature themed engagement rings. Obviously, our client loved bears! We put a Koala and a Panda on each side of the 3 main stones. The accents were a hybrid channel-prong setting. This an East-West version of one of a 3 Stone Oval Engagement Ring; and it is definitely simple and refined. Its uniqueness is that the stones are set horizontally rather than the typical vertical style. This Floral Split Shank Engagement Ring is one of the more unique bridal rings we have created. In milgrained engagement ring, the shank splits from a bezel set stone at 10 & 2 O’clock. From there, two diamond crusted leaves arch up the the center stone. This Split Shank Modern Engagement Ring is an elegant design you won’t find anywhere else. Although we can say that about all of our work! In this one, 2 of the prongs are formed by the shank and the other two appear out of nowhere for a dramatic effect. This split shank ring has the shanks crossing over each other. What we like about this one is that there are only stones on one of the shank. This Celtic Engagement Ring has triquetras going around the band that culminate with 3 accents on the cathedral shoulder. The basket holding the 6.5mm center stone is accented with triquetra arms as well. 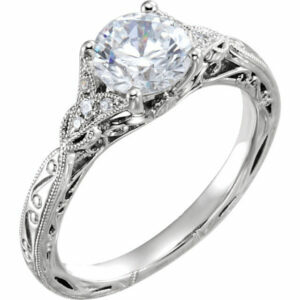 Here is another Celtic cathedral engagement ring that we love. On top of the Celtic symbols all over the ring, it has milgrain and diamond accents that help showcase the center stone. This Contemporary Cathedral Engagement Ring is a new twist on the classic cathedral ring. There are 2 rows of diamonds on the opposite sides of the band, which is a little cool, but then those rows are interrupted by swooping lines of stones that go up the sides of the cathedral. It is a very dramatic effect. Retail jewelry is designed to appeal a mass, undiscerning audience while maximizing profits. To do so, they use as little metal as possible, low quality stones, and employ child labor in their factories. At Valeria Custom Jewelry, we encourage clients to custom design their Custom Engagement Rings so that they receive exactly what they want. This is why we never cast a piece without the client’s approval. This means that you will get the ring that you dreamed of. At Valeria Custom Jewelry, the piece you create will be handmade and superior in quality and design to anything that has been mass-produced. Our rings are more durable than mass produced jewelry as well. They will generally last far longer than what you can get at the mall. This allows for custom made jewelry to be passed down from generation to generation. Creating Custom Engagement Rings is your opportunity to be immersed in creating a piece that you will cherish – not only because you had hands on involvement in the creation of the ring, but also because of what the ring represents. When it comes to Custom Engagement Rings, never settle. At Valeria Fine Jewelry, our expert designers will directly with you to ensure that when you receive the final piece, you’re not just satisfied, but blown away. Take advantage of our experience and knowledge. Contact Valeria Fine Jewelry to start work on your masterpiece today. Valeria Custom Jewelry is becoming the go to designer for unique and different custom engagement rings. Many of our pieces are so personal that they will never be made for anyone else again. And that is OK with us. All that matters to us is that each piece is special to its owner. At Valeria Fine Jewelry, we design Custom Engagement Rings from the ground up and as long as the ring can be cast, there will find a way to make your idea come true. We cast custom engagement rings in Gold, Sterling & Argentium Silver, Palladium, and Platinum using the lost wax technique. And the best thing about custom engagement rings is that they can be created with gemstones that you don’t find in chain stores. While Custom Engagement Rings are one of our specialties, we don’t limit ourselves to that! With the latest CAD program, we are a full service custom jeweler for all of your jewelry needs. Whether a wedding ring, pendant, or bracelet, we can make anything. Don’t settle for boring, pricey, mass-produced jewelry from the mall and chain stores. Show your personality and look into Custom Engagement Rings. Don’t you want your ring to have a story you can tell people??? Give us a shot for your Custom Engagement Ring! You will not be sorry. Click HERE to see our complete portfolio of custom engagement rings. Click HERE to lean more about custom jewelry, to view our the rest of our custom jewelry creations, or to contact us about a Custom wedding rings. It can cost less than you think to have your very own custom engagement ring made. Why settle for boring, uninspiring, mass-produced engagement rings from the mall? We can make exactly what you want. Don’t see what you are envisioning for your unique engagement ring? Send us the design you want and we will bring it to life.